Professional: US$75-$250 per hour / US$75-$250 per image (AU$95-$320). We can argue that a professional is anyone who is paid at least once for his photography. For the purposes of categorization, a professional is someone who depends on photography to make living. More precisely, professionals who have a solid portfolio to represent their specialty. Top Professional: US$200-$500+ per hour (AU$250-$630) / US$250-$1,500 per image (AU$250-$2,000). Is there really a top professional? In any industry, there always will be an élite group. In the case of photographers, some of the top image makers command over US$10,000 per day, or US$1,500 per image. Product photography in Australia costs around $100/hr. In some cases, though, prices can be as low as $80/hr or as high as $150/hr. This is due to varying factors like the preferences of customers or the level of expertise of the photographer. Photography cost variations per state. Product photography services in Victoria have the lowest average rate at $88/hr. New South Wales, however, isn’t too far behind at around $100/hr. In South Australia, product photographers charge approximately $130/hr for a basic session and product photography costs in Western Australia sit at around $150/hr. Queenslander’s pay the highest average price for this type of photography service at $160/hr. What Is A License/Usage Rights? The license is an agreement between you the photographer and the client as to the usage rights that have been granted for a given project. It might help if you think of the license as a lease and the usage rights as the terms of that lease. When you create a commercial image, or any image for that matter, you as the creator are always the copyright holder. When you give your images to a commercial client, you are not selling your images to them, but rather, renting. Sure the client pays you for your time to create the vision and that is what your creative fee covers. 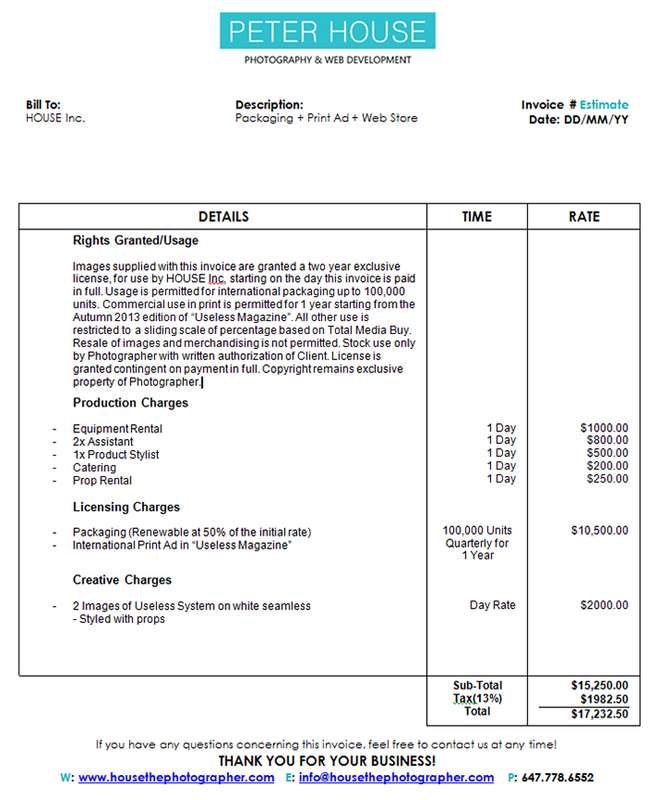 However, because each client is so unique and has such varying demands for your images, we can’t possibly rely on your fixed rate creative fee to cover all these variable possibilities. Issuing your clients a license allows you to “rent” your images for their specific needs. How To Define Usage Rights? The first thing you need to do is ask your client what the intended use of the images will be. Will these images be strictly for business to business presentations? Will they be used for local flyers? Maybe they will be used in a full page ad for a national magazine? Whatever the case may be, you need to sit down with the client, and ask them rather bluntly the full details of their intended usage. The next question you will have to ask will be, how long do they intend to use these images for? It may seem like an odd question but it is an important one none the less. Most licenses are drafted with a time limit because in reality clients do not need an image for life. It is rather normal for clients to overhaul their products every couple years to re-brand themselves and keep up an appearance of being fresh and up to date. Some clients will be under the unfortunate impression that once an image is created for them, it is theirs to use for as long as they please. Since the license is really more like a rental agreement, by asking for lifelong usage, the client is in fact asking to be overcharged. It is quite counter-productive to offer your clients a lifelong license when the odds are they will need new pictures after a few years. To keep costs down for your clients, it is best to offer a standard license term, generally between 1-5 years based on the life cycle of your client’s product. Once you know all the details, you are able to create a legal document known as the usage rights that will clearly state each and every media outlet as well as its related time frame and all other pertinent information relating to the project. How To Price Your License? The easiest and simplest way I have found to price a commercial license is to simply find out what the total media buy for your particular project is. The total media buy is another way of saying, how much money is your client spending on the media outlets where your image will appear. Most clients will have a pretty solid understanding of their marketing campaigns for which you are creating the images and will be able to offer you precise figures. Marketing campaigns come in all shapes and sizes. Small local retailers might only intend to use your image in a local paper for 1 year. This might cost them $3500. A larger international retailer on the other hand might use your image in a multitude of places, and their budget for that might be $350,000. In order to fairly value our work we employ what is known as a sliding scale. A sliding scale simply means that the more money your client spends on their marketing campaigns, the bigger the discount they receive on their license. To put it another way, we need to employ a sliding scale which allows us to charge a higher license rate for smaller clients to offset their smaller marketing budgets, whereas larger clients who have bigger marketing budgets will receive a smaller license rate from us so that we don’t over price our services. Above And Beyond. As you may have noticed on the invoice, I have included a clause which states that upon renewal of the license, the fee will be applied at 50%. This is an option which you can include because once the terms of usage have been set in the license agreements, most clients don’t intend to go beyond them. Should a situation arise where they need to, you can offer them a price break for that unforeseen future use. An example of this might be if you shoot catalog images for a client. Styles usually change with every season and most images are not considered current beyond 2 years. If a client has unsold articles which he would like to place in a clearance sale, you can negotiate a license renewal, but it might not be fair to charge the full rate for such a use. Thus offering a 50% discount in these situations is a welcome courtesy.